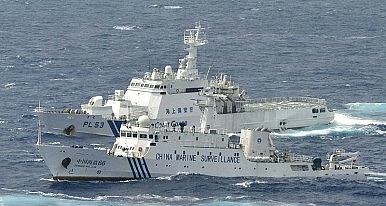 China’s response to Japan’s national security strategy reveals the underlying issues of history, distrust and hypocrisy. On Tuesday, Japan approved a 10-year security strategy. Over the next five years, Japan will increase military spending by about 1 trillion Yen ($9.73 billion) over the past five year period. Much of the spending will involve new military assets, including additional destroyers and submarines as well as drones, fighter jets, and amphibious vehicles. The increase in military spending and the type of technology seems to confirm that Japan’s defense strategy is aimed at defending the territories which are also claimed by China. “China’s stance toward other countries and military moves, coupled with a lack of transparency regarding its military and national security policies, represent a concern to Japan and the wider international community and require close watch,” BBC quoted the security strategy as saying. Not surprisingly, the new security strategy caused an immediate backlash in China. An English-language editorial published by Xinhua called the security package “a turning point in Tokyo’s understanding of security and a signal that the dangerous ‘Abe-military’ has come on stage.” The details of the Chinese response highlight several underlying sources of tension in the region. On a related note, such viewpoints always skirt the edge of daring Japan to repeat history. The Global Times editorial warned Japan that “the present international landscape makes it hard for Tokyo to embark on a militarist road, notwithstanding Abe’s desire for the glory of a fascist Japan.” During the early 20th century, China was undergoing a historically abnormal period of military and political weakness. Now that China is once again a regional power, there is a sense that, should Japan try to repeat its strategy of aggression, China will be ready. Such comments serve as a warning, but also can be disturbingly wistful. The most extreme elements in China are eager to avenge the period of occupation by Japan, and would almost welcome a conflict between the two nations so that China can prove its current strength. Second, as part of the legacy of earlier conflicts, China is completely unwilling to trust that Japan has peaceful intentions. The Xinhua editorial dismissed the notion that Japan has any interest in preserving the peace. “To conceal Japan’s wild ambition of becoming a military power, Abe tailored for his security scheme a phony coat in describing his plan as becoming a ‘proactive contributor to peace.’ ” The editorial also believes that Japan will use false premises to push its military development past the strict constitutional limitations: “Japan may use ‘assisting the U.S. army’ as an excuse to break the limitations on its activities under its collective self-defense right.” Likewise, Hua Chunying was disinclined to trust Japan’s word, insisting upon actions instead. “We also hope that Japan will not simply make [a] verbal commitment to peace, rather, Japan should translate it into concrete actions and play a constructive role for regional peace and stability,” said Hua. This leads to the final issue — though China insists that Japan must match words and deed, China is just as adamant that other countries should judge Beijing on its words alone. Other nations don’t need to worry about China’s military build-up because China tells them they don’t need to worry. China consistently refuses to admit that it has played any role whatsoever in increasing tensions. Any regional concerns over China’s moves in disputed regions are dismissed with a wave of the hand and platitudes regarding China’s “peaceful rise” — a phrase just as unconvincing to Japan as Japan’s own statements are to China. The Xinhua editorial completely dismissed the notion of a “China threat.” “Anyone with knowledge of recent developments knows it is Japan that stirred up the rising tension with China and is posing a threat to regional peace and stability by leaning to militarism,” the authors scoffed. Japan is hardly an innocent victim, but by refusing to acknowledge that there is room for alternate interpretations of China’s actions, Beijing makes it difficult for true negotiations to take place. Under this logic, every Chinese move is justified by an action Japan made months, years, or decades ago. On the other hand, no Japanese counter-move is ever seen a justified or a response to Chinese provocation. This double standard is also ably applied by Japan’s government. To Japan’s leaders, the new defense security strategy is a logical response to China’s alarming actions, and Japan’s leaders will not doubt react with shock (feigned or not) that such a move is seen as a threat by others. The tendency of each government to see its own actions as completely justified and the other’s actions as uncalled-for provocations creates the vicious cycle of action and counter-action we are stuck in today. Problems of historical legacy and the resulting distrust are unlikely to be solved any time soon. However, both China and Japan could improve the situation drastically by following Hua Chunying’s advice to “respect the just and reasonable security concerns of countries in this region” —especially each other’s. As long as Abe remains Prime Minister, don’t expect China-Japan ties to thaw.